Leia goes on a dangerous search for a new Rebel base! The Rebel Alliance faced plenty of challenges in the wake of “Star Wars: Episode V – The Empire Strikes Back.” Most pressingly, they needed to find another new base of operations and figure out how to recover Han Solo from Jabba the Hutt. 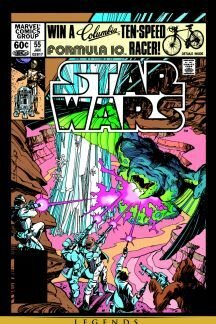 In 1981’s STAR WARS #55, writer David Michelinie and artist Walt Simonson dealt with the first problem head-on as Leia Organa lead an expedition to a planet called Arbra, which seemed like a perfect spot. As Leia explored, Luke and the Rebel fleet carried on in orbit around the system to minimize the Empire’s ability to find and attack them. The hero, uncomfortable with the plan that required the fleet to leave Leia and her crew if they didn’t hear from them within three days, struggled to keep calm. On Arbra, while the Rebels slept in their encampment, a group of local furry animals called Hoojibs started wreaking havoc on their equipment. But when the creatures attacked C-3PO, the droid sounded an alarm, alerting the group to the threat. 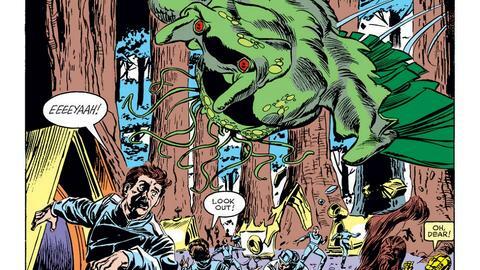 In the middle of all that chaos, Leia discovered that the Hoojibs actually consumed energy—then got a much bigger surprise when one of the Hoojibs telepathically introduced himself as Plif! Plif explained that his people fed off of the geothermal energy collected by crystals in their cave. And, in addition to dealing with the Rebel visitors, the Hoojibs also knew of a threat in the form of a space-faring monster called the Slivilith. Plif relayed that the Slivilith attacked their cave in search of warmth, forcing the Hoojibs to run away from their home. Knowing that they needed to stop the Slivilith so they could regain energy to fuel the radios and call the fleet, Leia agreed to help their furry new friends fight the beast. As a few Rebel soldiers fought the monster with primitive weapons, Leia and Chewbacca lured it into the cavern where they distracted the menace before Chewie grabbed the tentacles dangling from it’s body and slammed the Slivilith into a wall of crystals, ending its rampage. Though that threat was neutralized, tensions remained when members of the Rebel party said they could easily take over Arbra to use as their base of operations. The Hoojibs did not agree, so the battle nearly continued—until Leia stepped in to say that taking over this planet would make the Rebels no better than the Empire. 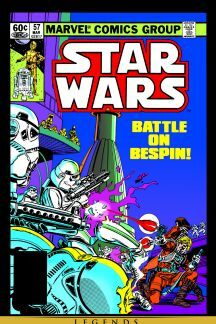 As they turned to leave, Plif, moved by Leia’s virtue, said that the Rebellion could stay on Arbra as their guests for as long as they needed. 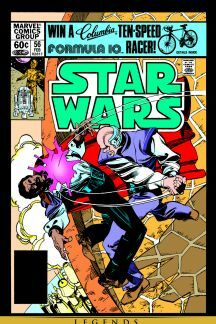 During this story, readers witnessed Lando Calrissian tell Luke that he had decided to take the Millennium Falcon and return to Cloud City because he couldn’t shake the difficult memory of the Empire taking over the place he was responsible for. At the end of the tale, Lando flew the Falcon through the Bespin skies, aware that something drastic had occurred…he landed to find that Cloud City had been completely deserted. Read up on how he responded to that discovery in STAR WARS #56 and #57!